If we’re going to reduce carbon emissions in the Western world and maintain a decent standard of living, there needs to be a renewable energy revolution. If the poorer countries of the world are going to share in the benefits of energy without destabilising the climate, it has to turn to renewable first time round and resist the easier options of coal or gas. To make that a viable option, renewable energy has to get a whole lot cheaper and more efficient. It’s these kinds of considerations that make research and development in the field of renewable energy the most urgent industrial priority of our time. A truly sustainable energy system would be one that requires no external inputs other than the one that nature itself uses – sunlight. Every living thing is solar powered, plants directly so, plant eating animals indirectly. When you sit around a log fire, you are enjoying solar power: years worth of sunlight saved up and stored in convenient battery-like slices of what was once a tree. When you drive your car, it is on solar power: the fiercely concentrated fossilized remains of ancient living creatures. The big problem with renewable forms of energy is that they are variable. Tidal power is subject to calm seas, wind turbines to windless days. Solar power works best in bright sunlight, something that can’t be taken for granted in many countries even during the day. And at night, when electricity uses rises, there’s no power at all. At the scale of the national grid, there is no way to store the energy that is generated, meaning we still need coal or gas to provide a baseload. The grid is able to store a limited amount of energy by pumping water uphill during low demand times, and letting it flow back downhill at times of peak demand, passing through turbines on the way. That’s very useful, but it does require a big hill – fine for Scotland, not so great for the plains of East Anglia. So it’s something of a breakthrough that the latest solar power stations are able to keep working at night, and the key technology is molten salt. I didn’t know much about this. Not being of scientific mind, I wasn’t even aware that salt could melt. It’s not something I’ve seen in my kitchen, but that’s because salt melts at 800 degrees C.
The world’s first commercial molten salt solar station opened in Sicily last year. 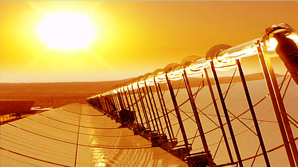 It’s a concentrated solar power set-up, where a field of parabolic trough-shaped mirrors heat pipes running across them. The heated salt is then pumped into a tank. From there, that store of heat can be used to create steam, which runs through turbines and generates electricity. Because salt is such a good store of heat, the station can run for eight hours after sundown – 24 hour solar electricity. There’s a useful diagram here if you want a more technical description. A molten salt station has been given the green light in California, another in Arizona. It’s still a new technology, but it’s just this kind of innovation that we need. The 21st century is the century of solar. It has to be. For more information, see this article from Scientific American, or visit the Halotechnics website. This is what I long thought hydrogen power would be used for, but we’ve yet to see it happen. I also remember reading about seven years ago about solar chimneys, another way of making solar power more effective, but I haven’t heard any more about them since. I think it is encouraging that new ideas are generated, hopefully in the future we can rely on a variety of different methods to generate power. I agree with the last comment we hear about new ideas but never in any great detail to understand whether they are going to develop the idea or whether it just didn’t work. In the post it was mentioned about making it cheaper to find new sources, although their are capital allowances out there for companies to get more involved in solar (.etc) I think more could be done to help companies get involved and understand what options are available to them. We are all being told, every day, that we need to do our bit to save the planet and prevent global warming. That’s all very admirable, but most of us have trouble finding enough time and money to just pay the bills, never mind go on an environmental crusade. But, have you ever thought that the two needn’t be separate – it is possible today to save yourself a lot of money while still helping to save the planet. Previous Entry A trillion dollars of wasted aid?